If I am asked whether I like sweet wine, my immediate answer would be no. I do not enjoy White Zinfandel, sweet California Riesling, or the terrible cheap German wines so common in the UK in the 70s and early 80s. However, that simple response is not entirely accurate, because there are sweet wines that are delicious, especially when correctly paired. One of the most famous of these wines are Sauternes; a sweet white dessert wine from the Bordeaux region of France. California Girl comments: Sweet wines, in general, are not my first choice. However, a good port or a dessert wine sometimes appeals to me. It always seems to be in the winter though, when I am making heavy, heartier meals. Sauternes is made from Sémillion, Sauvignon Blanc, and Muscadelle; with the first of these grapes being the main variety. The wine is sweet because of the manner in which the grapes are harvested. The harvest is late and grapes are only picked once they have Botrytis Cinerea, known in English as noble rot. It is a grey fungus which weakens the skin of the grape, allowing water in the fruit to evaporate, which raises the sugar level. Harvesting the grapes takes several passes through the vineyard so that grapes that have yet to be infected by Botrytis Cinerea can be left on the vine. If the weather stays wet, the beneficial fungus can turn into grey rot, which destroys the grape; in some years producers can make no Sauternes at all. Moreover, yields from Sauternes vineyards are less than half those of traditional white winemakers in the area. The multiple harvests, the risk of noble rot turning into rotten rot, and the low yield are all contributing factors to Sauternes being an expensive wine. Typically prices are over $50 for a half-bottle; the standard size for this wine. My aforementioned prejudice against sweet wines had meant that I had not tried Sauternes, until we were at a Far Niente hosted winemaker’s dinner earlier this year. Dessert at this dinner was paired with Dolce; a Far Niente wine made in the style of a Sauternes. If you look at a list of recommended pairings for Sauternes, you will see cheese, fruit-based desserts, and foie-gras. This last suggestion was presumably the inspiration for the chef to serve a foie-gras stuffed donut as part of the dessert. Paired with dessert, the sweetness of the wine was no longer the dominant characteristic; I was able to appreciate the complexity and subtlety of the flavours. Despite being impressed, the cost of these wines had acted as a deterrent to exploring them further and trying a real Sauternes. 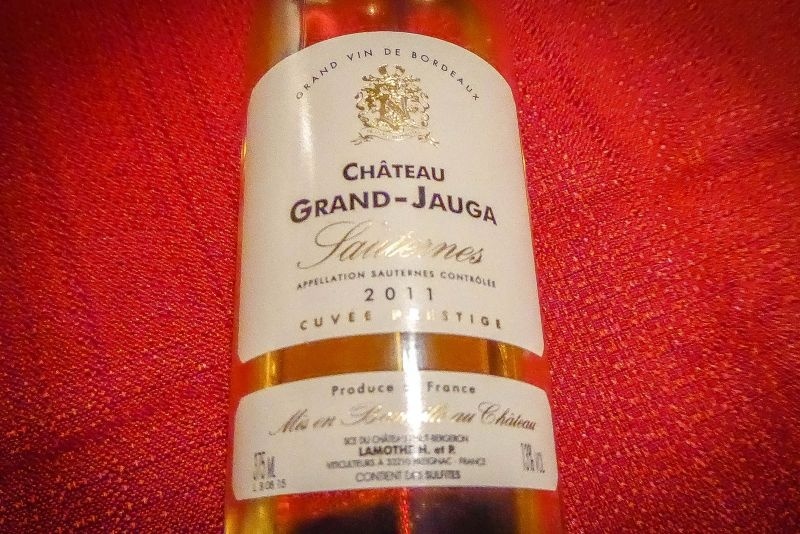 That was until our friends at Napa Valley Wine and Cigar told us about a half-bottle of 2011 Châteu Grand-Jauga Sauternes that they had for under $20. This seemed an ideal opportunity for California Girl to make a fruit-based dessert and for us to pair it with the wine. California Girl made lemon cakes, topped with white chocolate. California Girl comments: What most people don’t know about dessert wines is that they are meant to actually pair with desserts! I know that sounds funny when I say it but something interesting happens when you put them together; the sweet wine and the dessert cancel each other’s sweetness. Together, they leave a far richer, less sweet flavor on the palate. It’s like magic! I decided to bake delicate lemon cakes because I felt that the flavor of the citrus and the light texture would be the perfect pairing for this thick and lush wine. I also love pairing these types of wines with opposite flavors, like sour and creamy. Sauternes pair beautifully with goat and sheep cheese. French cheeses like Camembert and Bourson are a couple of others to add. The European custom of serving cheese and biscuits as a dessert makes wines in this category shine. As for the tasting notes on the wine: The wine offered a citrus forward nose of grapefruit and orange, with an earthy backdrop and floral notes that evoked a vase of lilies. I took my first sip before I tried the lemon bar. That taste was dominated by a honey sweetness. I then took a bite of the delicious dessert. In my second sip of the Sauternes, the acidity was accentuated; the sweetness no longer to the fore. The wine was now a subtle mix of lemon and almond. In summary, this is a well-priced and delicious way to try a Sauternes without paying the equivalent of a $100 per 750ml. We have recently joined a group of other wine bloggers called #Winophiles . To read more about the subject of French Sweet wines, Please check their blogs out! Hi Lynn, we actually have many versions of Dolce in the house, we just didn’t have anything French (weirdly). I also never even thought to pair them with anything other than cheese and biscuits for dessert. I am expanding my thinking about what to do with dessert wines. Its been a fun exercise for us. I don’t need any coaxing, I’m a confirmed (well made) sweet wine fan. I’m so glad you found a more affordable one, they’re out there. It helps when they lack the 1855 classification! Jeff, we don’t really drink many sweet wines in our house although we happen to have several from Napa and a couple from Canada and even one from Italy. We also have some Spanish Sherry, and Port from Portugal. With all of that huge collection, we had zero from France. It seemed bizarre. It’s wonderful to have a local business I could call like Napa Valley Wine and Cigar who I could source great unusual wines for at a good price. Lovely pairing – it’s always interesting to see how food affects a wine’s flavor, and vice versa. Cheers! 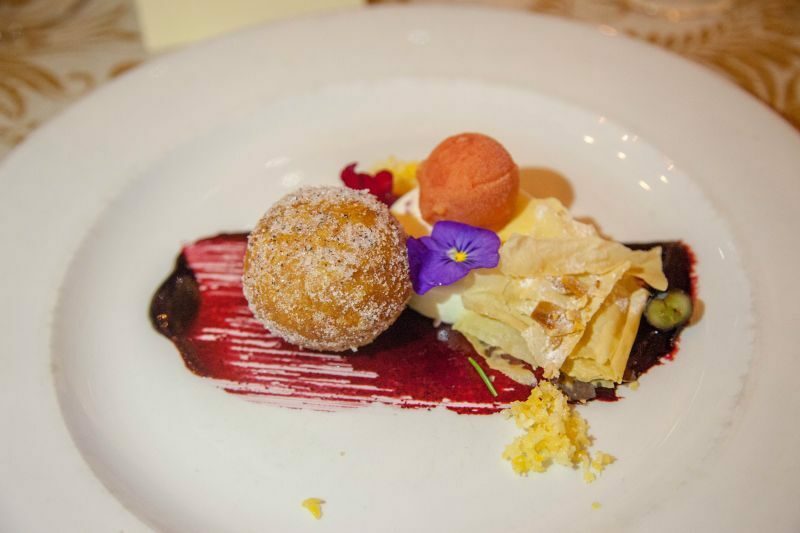 The great thing about well made sweet wines is that they are not only meant to pair with desserts. Think about how many people drink Coke with a meal. Coke has way more sugar and less acidity than a well made sweet wine. Sweet wines can pair beautifully with a well thought out main dish in addition to being great with so many desserts. Thanks for sharing. Glad to have a recommendation for a Sauternes that won’t break the bank. Thanks for that! You are welcome Camilla. Thank you for reading and commenting! I’m a fan of sweet wines. The Missus, not so much, so we don’t purchase them often. She does enjoy a good Sauternes though and yours and the pairing looks like a winner Amber! The thing about sweet wines as I said on the blog is that they tone down sweet things. (Obviously, I am not included..lol) I don’t really enjoy anything overly sweet so this is a great solution. I also tried this wine as per Michelle’s suggestion with a spicy Indian Curry. It was wonderful. Sweet takes spice away like magic! I found and wrote about a reasonably priced sauternes as well — they are out there! The less expensive ones definitely improve with age. Welcome to the group! 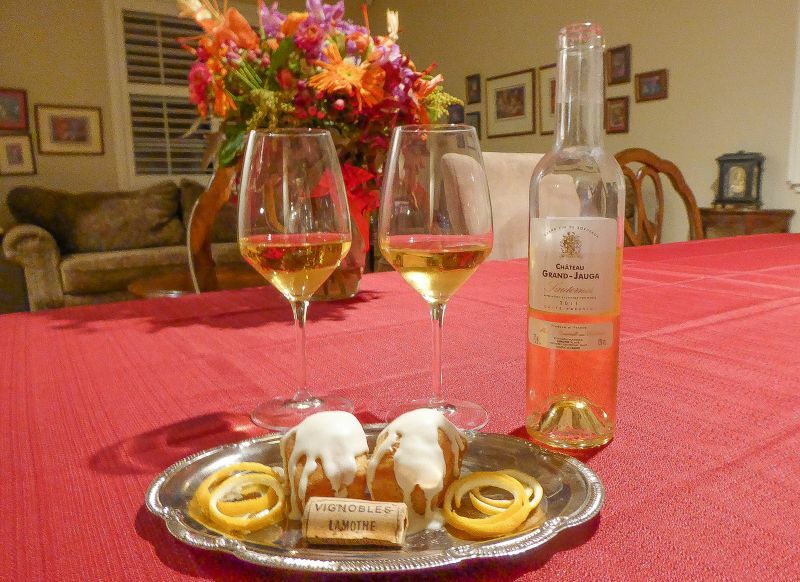 So many misunderstandings about delish dessert wines! You’ve captured the benefits of including them in the everyday – a good kick for a new year!